To achieve your victory, you must define it. Every exercise has a step-by-step video. 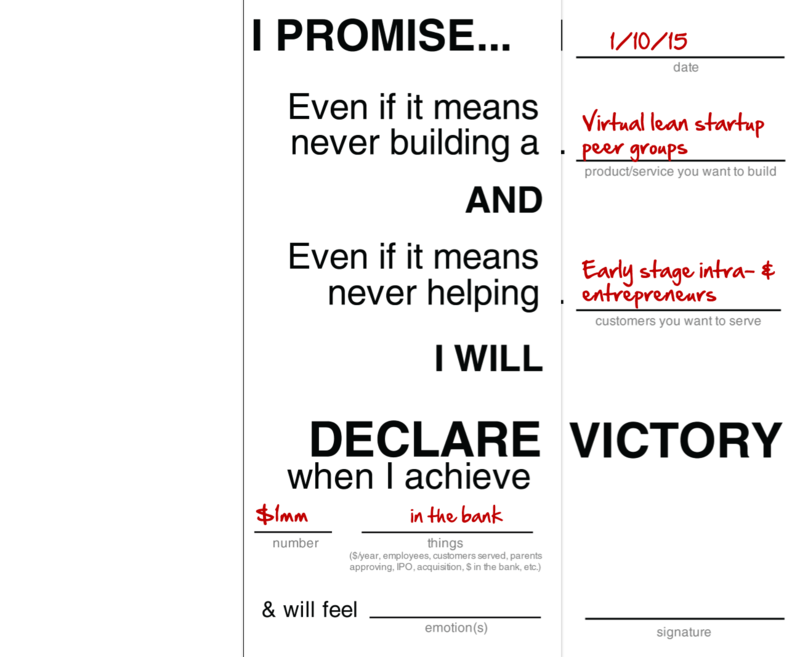 "Hand's down the best resource I've seen on Lean Startup." FOCUS isn't a book series, it's a workbook series. Ready to start your first FOCUS exercise? With FOCUS, you'll use printed worksheets to design your validation experiments. This preview will give you a feel for FOCUS (without having to turn your printer on). Start by writing in today's date in the field on the right. Next read the Declaring Victory overview. 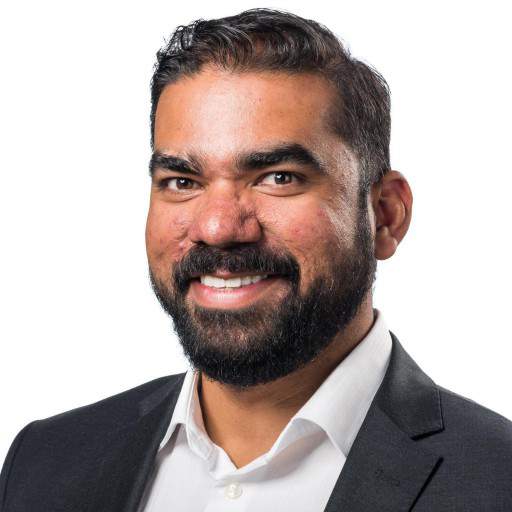 It'll walk you through why this first exercise is critically important to achieving Product-Market Fit. Your #1 priority as a founder, is to find Product-Market Fit. Founding teams struggle to find Product-Market Fit, in large part, because they don't define it. In this exercise, you'll solve that problem. 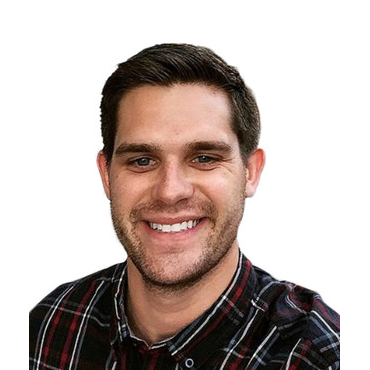 "Being in a good market with a product that can satisfy that market." That's a helpful start, but what constitutes a "good" market? And how do you measure if you've "satisfied" it? It turns out while Andreessen defined the term, you get to decide what it means. You are the one starting the company, so you get to decide what a "good market" is. For one founder, satisfying a good market may require building a $10 billion business. For another, it may mean creating a company she can run while travelling six months a year. For another it may mean lifting tens-of-thousands of people out of poverty. Your company is a vehicle to achieve your goals. To satisfy a good market simply means you've built a company that enables you to achieve what you set out to. Of course to achieve those goals, you have to know what they are. The process of defining your personal success criteria is called, Declaring Victory. 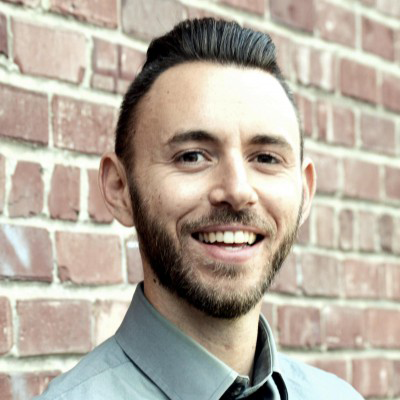 Which customers should you target first? What features should your product have? What skills should your co-founder(s) have? The answers to all of these questions will be easier to come by, once you declare your victory. It doesn't serve you well while you're searching for a sustainable business model. Listen to your customers, without leading them. This is impossibly difficult when you're emotionally attached to a product, but not when you're attached to your victory. The most powerful thing you can do when building your startup team, is align the founders' goals. What qualities do you want in the people you hire? What happens when we run low on money? If the co-founding team's goals are not aligned, all of these questions will lead to arguments, and ultimately break up your startup. On the other hand, aligned goals will make seemingly difficult discussions easy, enable your leadership team to support one another during difficult times, and make it more likely you'll all achieve what you're looking for. 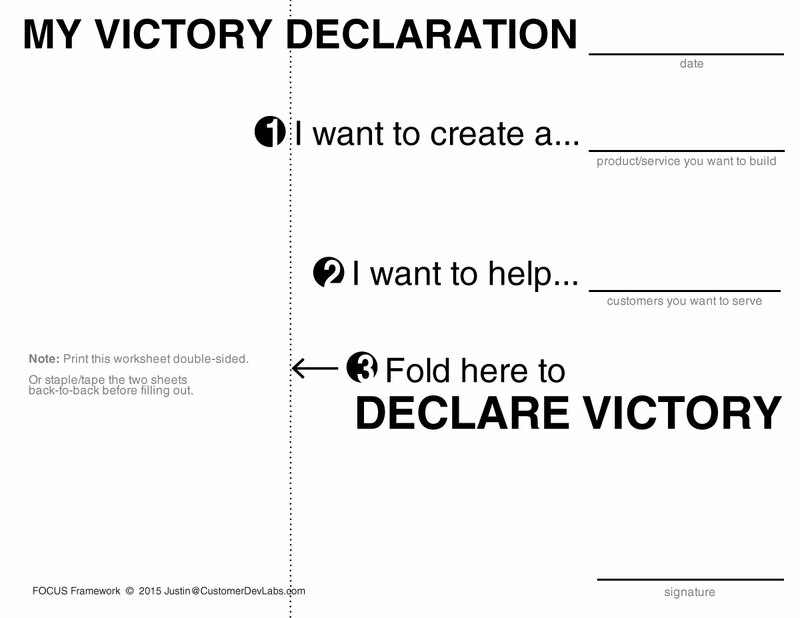 How do you Declare Victory? Write in the product or service that you would like to build. As you move through FOCUS's exercises, I'll illustrate each step using my own experiments and experiences. Write in the customers or people whom you would like to serve. 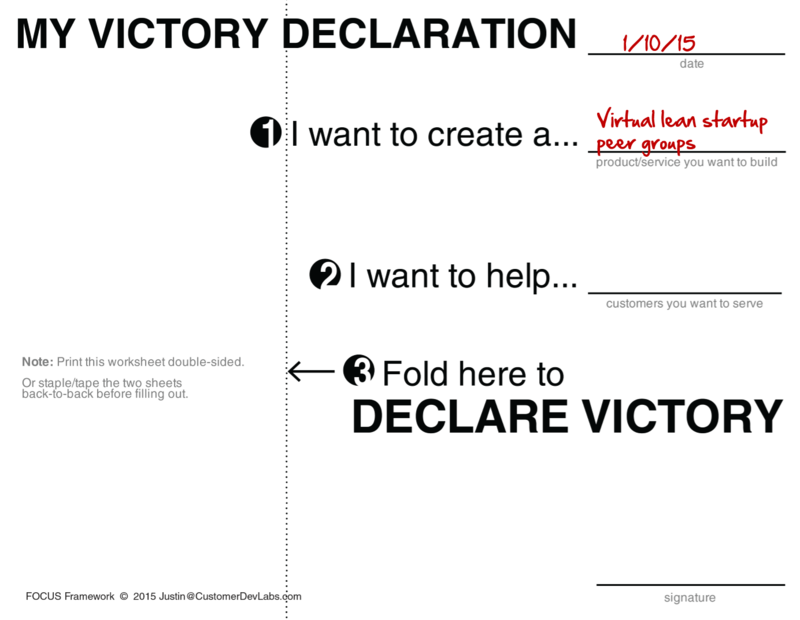 Click next to fold the worksheet on the dotted line over and Declare your Victory! You are still going to achieve victory. In Step 1, you stated that you want to build a specific product; however, chances are, that product that you're so attached to, is not what your customers want. Yet you're still going to achieve victory. In Step 2, you stated that this product will serve a specific type of customer; however the customers who truly want, and are in a position to pay for, your help are probably different than the ones you're imaging now. Yet you're still going to be victorious. In this exercise, you're making a promise to yourself that even if you have to pivot your product, and even if you have to shift your customer segment, you are committed to your personal fulfillment. What does Victory look like to you? Is it dollars in the bank? Fewer hours at the office? Take a second (or hundreds of them), to get a sense for the personal change you'll achieve once you're a successful startup founder. Have an incredibly important purpose...just not here. You'll create a company vision soon enough...just not now. This isn't about the change you want to affect in the world, because the time may not be right for that change. You may have no control over if/when that change comes. To emotionally attach to it now is to blind yourself to change that can be affected. Your victory, is about you. How do you want your life to be different? What achievements do you want to accomplish? The sooner you embrace the idea that this journey is about making positive changes for yourself, the sooner you'll be able to create change for others. Whatever you decide your victory is, make sure it's measurable by filling in the â€œnumberâ€ blank. That'll make it infinitely easier to guide your entrepreneurial ship in that direction. In my example, what I was looking for most was financial security. So, no matter what I build or who I am able to help, this is my victory. That's fantastic. That'll make it easier for you to know if you're on the right track to achieving your victory - which will make it easier to achieve. Just make sure every victory criteria is measurable, and isn't dependent on what you want to build, or who you want to build it for. Write in your measurable Victory metric. While it may be a bit challenging to come up with, your Victory must be measurable. If it's not, you won't be able to tell if you're on track to get it. What Emotions are you Seeking? Now that you know what your true victory will be, write in how you imagine it will feel to achieve. What emotions come to mind when you imagine what will be different in your life when you declare victory? Remember that misplaced emotional attachment kills companies. Instead of emotionally attaching to a specific product, you're going to focus your energy where it's most efficient: achieving the emotion that is driving your entrepreneurial journey. Congratulations! You have your victory. Now you know exactly what Andreessen meant when he said, "Being in a good market with a product that can satisfy that market." You will have found Product-Market Fit, when you satisfy a "good market" that enables you to achieve your victory! Sign your name and post this paper in a very visible place (e.g. your desk, your night stand, your bathroom mirror, your car, etc.). 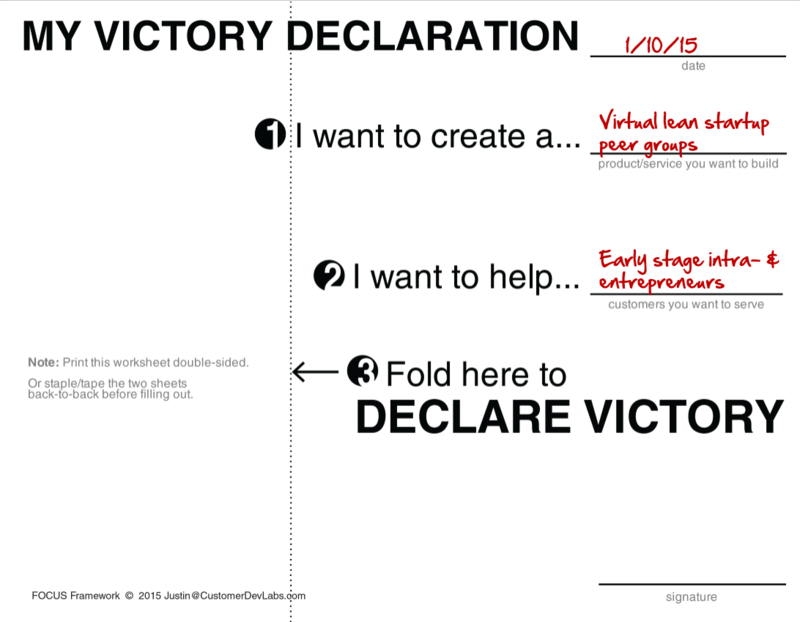 This paper will remind you of your true aim - even if you have to kill your idea, even if you have to pivot your customer segment, you will still be moving towards your victory by focusing on your personal outcomes. What are your Co-Founders' Victories? Ask your co-founder(s) to complete the exercise too - either now, or when they join your team. It can be awkward to sit down with your co-founder(s) to understand why they want to start a company - what "victory" looks like for them. At the same time, it's the most important conversation you will have with them. 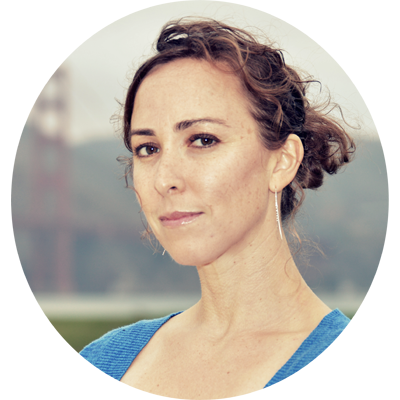 Misaligned goals is the #1 reason founding teams break up. 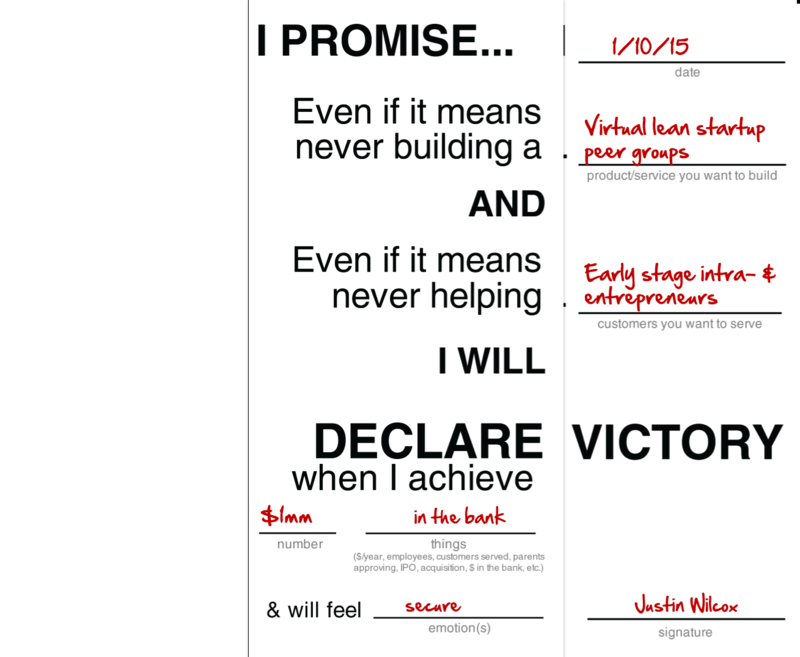 On the back side of the worksheet is a place for your team to merge your declarations into a single, unifying victory. By merging your goals into a team-wide victory declaration, you can ensure everyone is on the same page and have a common reference point you all turn to when making decisions. If you're not able to align your goals, better to discover that now than later. So often one founder wants to change the world, while another simply wants personal financial freedom - both are great, but not in the same founding team. The sooner you find out what you and your co-founder(s) want, the more quickly you can get it...either together, or apart. I told you at the beginning of this exercise that to find Product-Market Fit, you needed to define it, and to define it, you'd need to declare your victory. Declaring Victory - your personal victory - makes decisions easier by reminding you what's most important about this journey. Declaring Victory gives you the confidence to pivot because focusing on your personal goal allows you to respond effectively to real-world data - even when that data is different than what you wanted it to be. 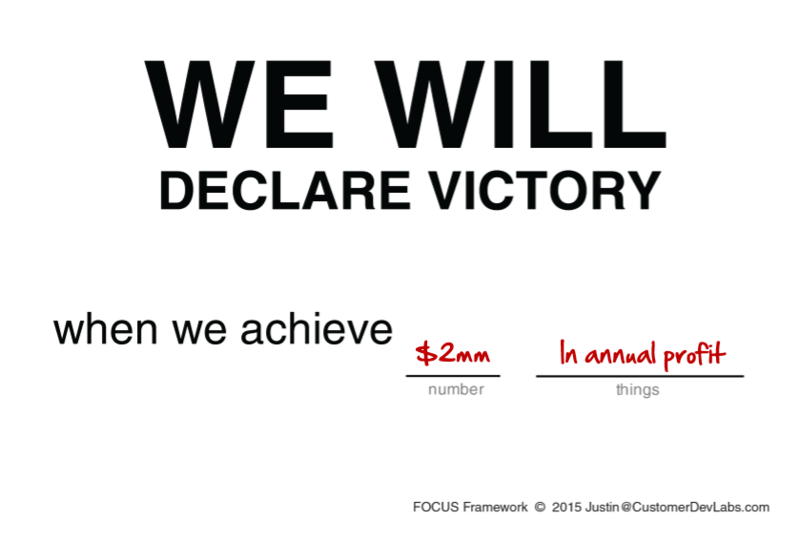 Finally, Declaring Victory facilitates the critical "Why are we all doing this?" conversation between you and your co-founders. The results of this conversation will strengthen your team to withstand the emotional roller coaster that is starting a company. Congratulations, you've taken the most important step of your startup journey, you've Declared Victory and in doing so, defined your Product-Market Fit. Now it's time, to go get it! 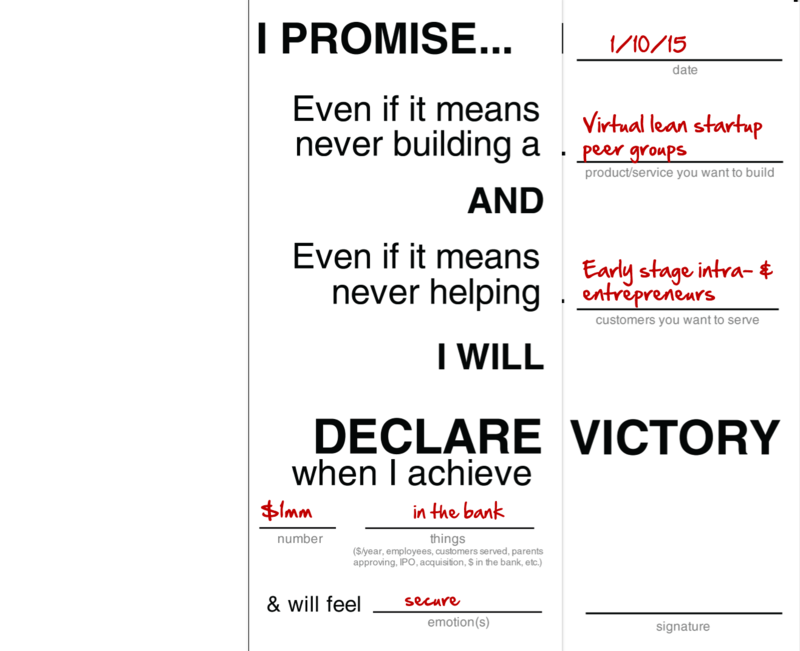 If you want a copy of this worksheet, and help achieving your Product-Market Fit, get your copy of FOCUS today! Video, print and electronic versions available. ...or get the Electronic Workbooks only. Print and electronic versions available. Every step you need to find Product-Market Fit. When will I get the FOCUS Framework? 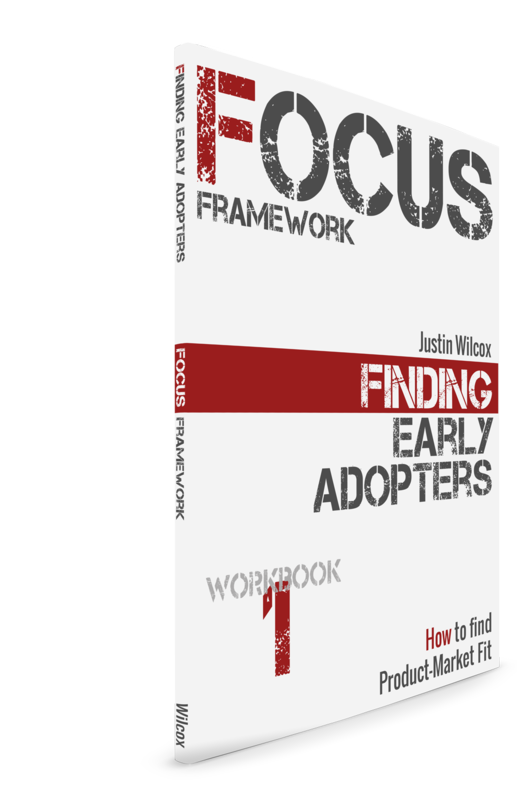 If you order the electronic versions, you'll get access to the complete FOCUS Framework immediately. If you order the printed version of FOCUS, US orders will arrive within 1 week and international orders should arrive within 1 - 4 weeks. What formats do the electronic workbooks come in? An online version that includes live updates to the workbooks, plus the ability to ask questions about specific exercises and get answer from me and other members of the FOCUS community. A PDF version you can read offline, whenever/wherever you are. When you purchase FOCUS, you'll get both variations. How does the 14-day money back guarantee work? If you decide the FOCUS Framework isn't the most practical guide to finding Product-Market Fit available, simply email us within 14-days of your purchase, and we'll give you a full refund minus any shipping fees. Product strategist / project manager nurturing PlanMyMeal.co, motorcycle rider, aspiring bodybuilder. 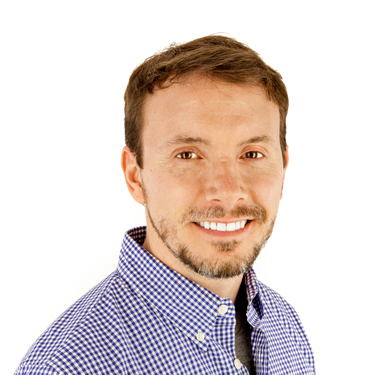 Founder with a passion for all things early stage, particularly finding product-market fit and making that first sale. 42 videos, all 5 printed workbooks, 2 sets of worksheets, plus the online and PDF versions of FOCUS. 5 days worth of workshops across 42 step-by-step videos, all of the electronic worksheets, plus the online and PDF versions of FOCUS. Best of both worlds. All 5 electronic workbooks plus, the printed box set. Ships in Aug. Plus: Includes a 30-minute consultation session. Keep FOCUS on your mind, and at your fingertips, with all 5 hard-copy workbooks in a beautiful box set. Ships in Aug.
Best of both worlds. The complete FOCUS Framework with all 5 electronic and printed workbooks. Keep FOCUS top of mind with all 5 physical workbooks and 2 printed sets of the worksheets, plus the online and PDF versions of FOCUS. Get both the online and PDF versions. Get both the online and PDF versions of the FOCUS workbooks. Normally $299. Save $100. Includes all 40+ exercises, tools and experiments you need to achieve Product-Market Fit. $50 off. Get access to all 5 of the FOCUS workbooks. Learn the steps that Airbnb, Uber and Facebook took to start their companies and follow in their footsteps to begin starting your own. More at www.TheFocusFramework.com. Get both the online and PDF versions immediately. The 1st workbook, Finding Early Adopters shows you exactly how to find and interview your customers. Learn the steps that Airbnb, Uber and Facebook took to start their companies and follow in their footsteps to begin starting your own. More at www.TeachingEntrepreneurship.org/exec. Normally $199. Save $100. Includes all 40+ exercises, tools and experiments you need to achieve Product-Market Fit.